I participated in the Black Diamond Triathlon today and am happy to say I finished! This was about as opposite from my first one as you can get. The Danskin had 4500+ women only participating in the sprint distance tri. For this one there were around 230 men and women participating in the same distance. The worst part of the event was the COLD COLD COLD. Driving to the event it was 49 degrees outside. I am guessing by race time it was around mid-50's with the sun just rising over the trees. The coldest part of my body was by far my FEET. Walking to the water barefooted over grass and rocks was pure torture. BUT the benefit of being so cold outside???? The water was warmer than the outside temperatures. The minute I got my feet in the water I felt relief. Unfortunately the pain resumed as soon as I was out of the water and they hurt all through the bike and until the last mile of the run. I had all sorts of clothing options for the day but hadn't even considered my feet. Okay, the whine fest is over now on to the good. 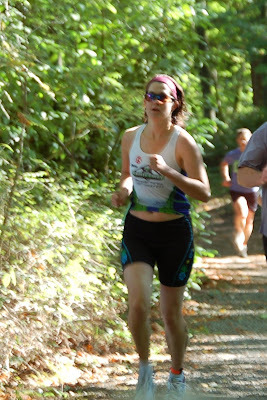 First off I got to participate with my friend (and part-time training buddy) Karin. It was fun to have a friend to share the experience. Though she is much faster than me (most are!) so this was the last moment we spent time together until I finally crossed the finish line. I enjoyed myself but felt fairly slow on both the bike and run. My final thoughts on the race are that I am proud I did it, but wish I would have trained a bit harder this last month. I am looking forward to next season with my big goal focusing on improving my run by attending coached run workouts and just trying to push myself harder. I am also looking forward to getting a new bike to help improve that section of the race. And a big thank you to my fabulous support crew who was again willing to get up early on a weekend and spend the day following mommy around. And this, by far was the best moment of the race! 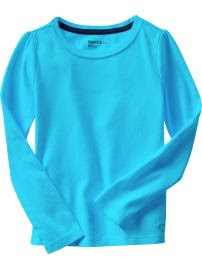 I saw these adorable long-sleeved t-shirts on the Garnett Hill website. SO CUTE. I was thinking about putting one for each girl into my cart until I took a look at the price. $48 They are cute but can't justify spending $100 on two t-shirts for my girls! So, that got my creative juices flowing. 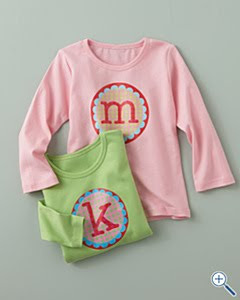 Remember THESE shirts the girls made using freezer paper and the cricut die-cut machine? I decided to use the same technique to make personalized shirts for the girls. I started with these plain long-sleeve tee's from Gap for $9 each. Then I used the monogram cartridge for the cricut machine (thanks Sara:-) I did 3 separate layers for the painting. I think if I did it again I would do a fourth layer of just a circle under the scallop but overall I think they turned out pretty good. Had a bit of bleeding with the dots so need to work on getting the freezer paper ironed down completely. What do you think? Can I sell them for $40? Probably not, but I am thinking I may mass produce a few for birthday gifts! Who doesn't love a personalized clothing item? I have made many huge batches of colored rice (and noodles) for fun activities with kids over the years. 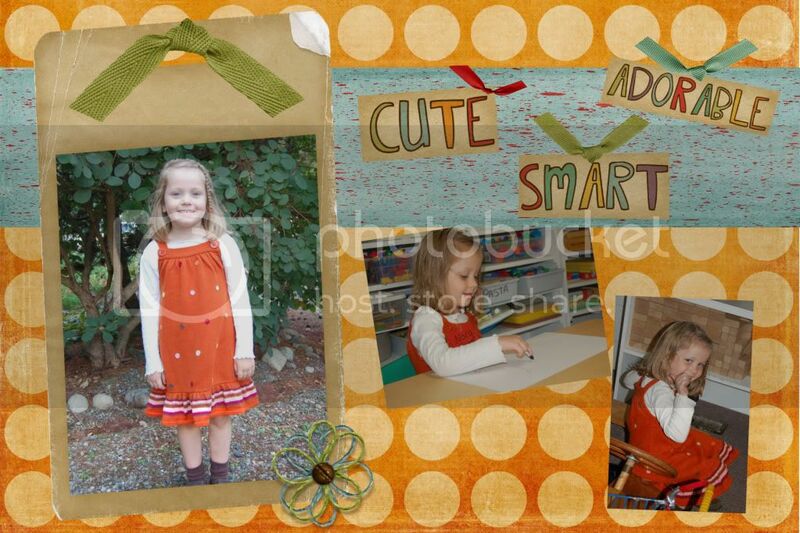 But I love Nora's preschool teacher's way to do it. As always, she turned it into a kid centered activity that was tons of fun with learning happening too!! As a former teacher myself, I know how much those little treats and notes mean to pick up a teacher's spirits. For the second year I am in charge of Staff Appreciation for PTA. This is a great position to have. None of the PTA drama (I get that from other positions I have:-) and lots of fun and smiles! It isn't too hard to please a group of elementary teachers. Last year I started some "craft and chat" times. An opportunity for parents to get together to work on some fun and easy crafts for teacher treats. It is a great opportunity for parents who may not be as involved with PTA to get to know some other people and we get fun treats made for the teachers. This week we made cute toppers for individual bags of apple chips. I had these overflowing out of a big basket along with numerous other apple goodies that were provided by other parents. Apples and carmel dip, apple cake, apple bread, apple muffins, apple cider...... A buffet of apple goodness! We also wrote little notes on apple paper to pin up to the bulletin board to let the teachers know how much we appreciate them. I also wanted to give a little Back to School gift for Madison's teacher. Tom thinks it is me trying to kiss up to the teacher, I say it is me being friendly and nice! I always had one or two moms each year who would give me random gifts and goodies through out the year. It certainly isn't necessary or expected by teachers. But I always thought that when I had kids I would want to be one of those moms and now I get the chance. So for Madison's teacher I got these 2 great books. 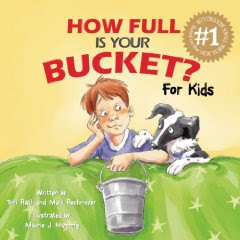 "How Full is Your Bucket" isn't a literary masterpiece nor is the artwork amazing, but the message is fantastic using the metaphor of every person having a bucket to measure their feelings. When people are kind to others their buckets fill up and when bad things happen their buckets dump out. 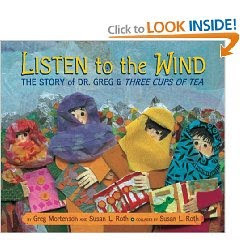 A very concrete way for children to understand how their actions effect their own and others feelings. With school getting started I am now trying to get into our "normal" routines and patterns. I have to admit the the whole strike thing threw me off and I didn't feel quite as prepared as I would have liked with all the extra details that had been floating through my head. We had 24 hours notice for the first day of school and although I knew it was eventually on its way I still felt a bit out of sorts. One thing I did last year for Madison was to include a "Love Note" in her lunchbox each day. I think I forgot less than 5 times the entire year and you can bet I heard about it afterwards!! No need to tell me the details of her school day, but I was sure to hear about the missing note! I am trying to expand upon the love notes this year to not get into it becoming the same thing daily. One way to do this is to get more creative with the notes themselves. I have been having fun using leftover scrapbooking supplies and stamps to produce a pile of notes. It is quick, easy and doesn't need to be perfect to satisfy my 7 year old! I found these on Martha Stewart. They are intended to be printed out as stickers but I just printed them on paper and cut them out. I can glue the circle ones onto another piece of paper to add detail and just write on the rectangle ones. Another key addition to the Love Note box is Joke Books. When I am feeling stuck on what to write I can just grab a quick joke to write onto the note. I also like to keep a variety of stickers, pens, fun scissors and papers in the box ready to go. The whole box has a spot on the pantry shelf so it is quick and easy to grab it on as we are rushing around trying to get prepared for the day ahead. As the supply gets low, that is my sign to raid my scrap room for more fun things to use in the box. A great way to clear out the scrap supplies and give Madison a special note in the middle of the school day! 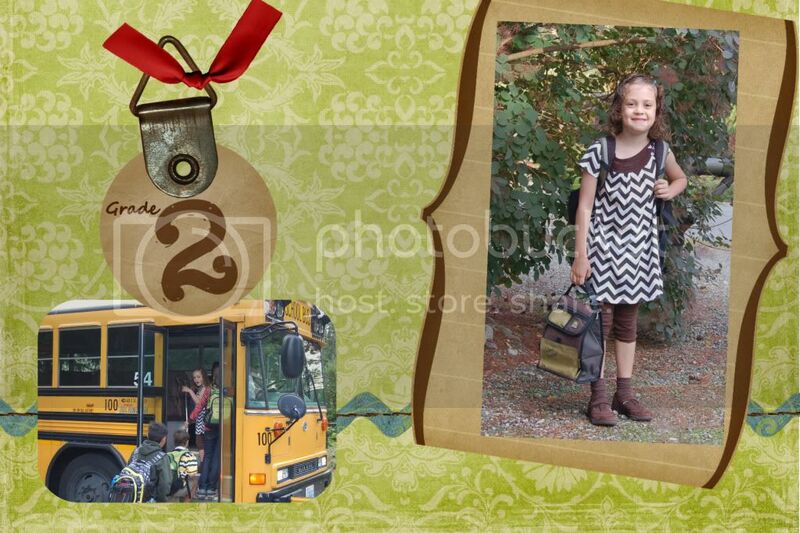 The strike delayed things by a few weeks but Madison FINALLY got her first day of second grade yesterday. It is amazing how it was like she had never left. She is such a confident kid (too confident at times!) and took off without even a glance over her shoulder for mommy. I think we will love her teacher this year and she has a great class of kids so we are looking forward to a fantastic school year. And then Nora had her first day today. Again, there was no hesitation or turning back for Nora. Going to the same place as last year definitely has its benefits!! Thanks to Grandma Margie for the shopping giftcards. The girls were quite thrilled to go shopping for their first day of school dresses! We are!! LOVE LOVE LOVE the start of football season. It is by far my favorite spectator sport and I have fond memories of when I was a little girl watching football with the family. The girls sing their Seahawk Song, we wear our Seahawk clothes and cheer our favorite team on. Doesn't hurt when they win big!!! Last season, the girls were a bit of fair-weather fans and their enthusiasm dwindled as the season progressed. Hopefully the Hawks have a bit more success this season to keep us cheering! Tom started a new touchdown cheer that the girls thought was lots of fun so I am sure that will catch on. We always start watching on the big tv but after too much distraction for daddy the girls move into the family room to finish the game to give daddy some space. Which then turns into this: And you can't kick off the football viewing season without a big bowl of Cheetos. YUMMY!!!! And it was also the start of the TRUE football season for Madison, Nora starts next week. Thanks to Andrea for introducing me to this. 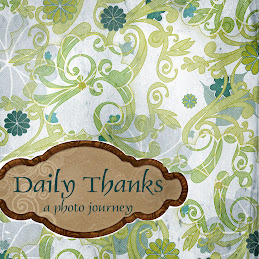 The concept is to take 10 photos on the tenth day of each month. Capturing snippets of your life. Here are mine for today. Click here for more to see more people who participated. Would you do it again?? That was the question of the weekend. We went on our first backpacking adventure with the girls. Our good friends came along with their 2 kids to make quite the expedition of kids ages 7, 5, 4 and 2. Along the journey we would often ask each other "would you do it again" to gauge the fun factor. My last backpacking attempt was 13 years ago and was not a success at all. After that I doubted if I would ever want to go backpack camping again. But I felt it was important to give it another go. Especially now that I am much more outdoor savvy than I was 13 years ago and we have access to the REI supply closet for all the newest and best gear we could possibly need. The weather was questionable at best and almost stopped the trip before it started. But we figured that was what gortex is for. At the worst, we could hike in and have dinner and then hike home. But once we got to the campspot the weather was clearing up a bit and we even had a bit of blue skies so the tents went up and camp was set. Yes, the Kimmet tent is the giant one. Technically not a light and small backpacking tent but it was nice and roomy for this family. The space was especially appreciated at 7:30 in the morning when it was pouring rain and we were able to eat breakfast inside the tent. We did have an unfortunate accident when Levi fell on a rock and got a deep cut on his chin. So our friends had to pack the kids out in the dark to go to urgent care for stitches. We missed having them around for the entire trip and look forward to doing it again with them with no complications. So even with questionable weather and injury, the answer to the question if YES YES YES I will definitely do it again. The camper has been great for getting out and exploring new places but I never really feel it is real camping. There is a bit too much convenience and people and not enough "roughing it" and the great outdoors. Especially as the girls get older I see us moving more towards tent camping and backpacking our gear into all sorts of amazing locations. It felt so great to be out camping where there was no noise but the wind in the trees, rain in the lake and crickets chirping. The girls did an amazing job hiking in with their packs (it was a very short 1 mile hike but was good for a first attempt) and stayed easily entertained finding "jewels", climbing rocks and exploring nature. We will certainly still get use out of the camper as it provides an easy and cheap vacation opportunity. I hope we can balance the two with a bit of both styles for the best of both worlds. Now, I must admit that the question really needs to be asked to Tom since he did the HUGE majority of the work. Packing up the gear, setting up camp, cooking on the camp stove, taking down camp..... So before I commit to a handful of outings I should probably make sure he is onboard for this as much as I am!! This is what happens when you go to the library BEFORE you hit the water park with Madison. And then we went for an ice cream treat and I finally had to force her to put her book down and eat the ice cream that was melting before her.